Looking for a New Cadillac CTS-V in your area? CarGurus has 977 nationwide Cadillac CTS-V dealers with 647 new car listings. If drivers thought Cadillacs were just standard boulevard cruisers with a cushy ride and padded interior, the CTS-V will come as a shock to the system. Cadillac built this sedan with one goal in mind: to be a world beater. The CTS-V matched key rivals from Germany on some of the most demanding tracks in the world, a testament to the company’s desire to be one of the best. The CTS-V’s story begins under the hood. A supercharged 6.2-liter V8 produces 640 horsepower and 630 pound-feet of torque. Power flows to the rear wheels through an 8-speed automatic. Its performance figures are shocking for a 4-door sedan. Zero to sixty takes only 3.7 seconds when using launch control, and the car can hit a top speed of 200 mph. Figures like these used to be achievable only if drivers had a powerful sports car. It’s worth noting that the upcoming BMW M5 and Mercedes-Benz E 63 AMG S are quicker to 60 mph: the E63S takes 3.3 seconds, and the M5 takes 3.2. While the CTS-V boasts more power than its two German competitors, the E63S and M5 come with all-wheel drive (AWD), which allows them to put all of their power on the road. The CTS-V’s EPA fuel-economy figures stand at 14 mpg city, 21 highway, 17 combined. With power figures like this, drivers may think the CTS-V is all brawn and no finesse. Not so, as Cadillac has fitted the CTS-V with a Magnetic Ride Control (MRC) system that uses special shocks filled with magnetic fluid to quickly adjust the suspension’s overall stiffness. This allows the CTS-V to feel poised when going around a corner. The steering provides decent weight when turning, but some reviewers note they would like more feedback. Off the track, the CTS-V’s sporting nature becomes a weak point. On rough roads, the stiff suspension will transmit a fair share of bumps to the backsides of passengers, even with the MRC system put into its Comfort mode. You’ll also notice a fair amount of road noise, mostly due to its sticky Michelin Pilot Super Sport performance tires. Walking around the CTS-V’s exterior, you might think Cadillac put the standard CTS on an intense weight-training session. The sharp lines and crisp angles are augmented by an aggressive body kit, mesh grille, 19-inch wheels with a dark finish, and a rear spoiler. An optional carbon fiber package adds a bit of aggression with a front[MH1] splitter, hood vent, rear spoiler, and rear diffuser. Satin Steel Gray Metallic, Vector Blue Metallic, and Genesis Metallic are added to the CTS-V’s color palate for 2018. Cadillac still trails the competition with its interior, due to some of the materials used. For example, the center control panel uses a sheet of piano black trim and is surrounded by matte silver trim. That looks out of place in a model that also comes with a leather-covered dash and a steering wheel covered in suede. Passengers sitting in front will find plenty of room to stretch out. A set of Recaro front seats are available and provide excellent support. Drivers will miss out on ventilated seats if they opt for the Recaros. The rear seats are a different story, as passengers will feel slightly uncomfortable due to short cushions and limited legroom. At least passengers will be able to charge their devices with two USB ports that come standard for 2018. Trunk space is small for the class, with 13.7 cubic feet on offer. Folding rear seats are available as an option. One welcome change is the new Cadillac User Experience infotainment system. Previously, reviewers criticized the CUE system for having a confusing interface, with routine adjustments taking several steps to complete. The new system offers a simpler interface that resembles the home screen on a smartphone. Other changes include the ability to set up different profiles for each driver and have it transfer to different Cadillac models, and the introduction of a new app store. Those who have tried the new system say it is much easier and less distracting when on the move. Apple CarPlay, Android Auto, and OnStar 4G LTE with Wi-Fi are standard. A 12.3-inch screen acts as the instrument cluster. Drivers can customize it, depending on the situation. Drivers can also sync their myCadillac app with the Apple Watch, a new feature for the 2018 model. The app gives them the ability to send directions to the car’s navigation system as well as remotely lock or unlock the car. Cadillac cribbed the Corvette’s Performance Data Record for the CTS-V. Available as an option, this performance system utilizes a camera and various sensors around the vehicle to capture video of a track day that drivers can review. Various bits of information can be overlaid, such as speed, braking force, and lap time. For safety, the CTS-V features a full suite of airbags, traction control, stability control, parking sensors, a reversing camera, blind-spot monitoring, rear-cross traffic alert, lane-departure warning and mitigation, and the safety alert seat. Optional is Cadillac's Rearview Camera Mirror, which gives an unobstructed rear view through the reversing camera. The National Highway Traffic Safety Administration (NHTSA) awarded the CTS-V a 5-star Overall rating. In the Insurance Institute for Highway Safety’s (IIHS) tests, the CTS-V earned the highest rating of Good for most of them, but in the Small Overlap Front test, the CTS-V earned the second-lowest rating of Marginal. When drivers buy a CTS-V, they get to enroll in the V-Performance Academy. 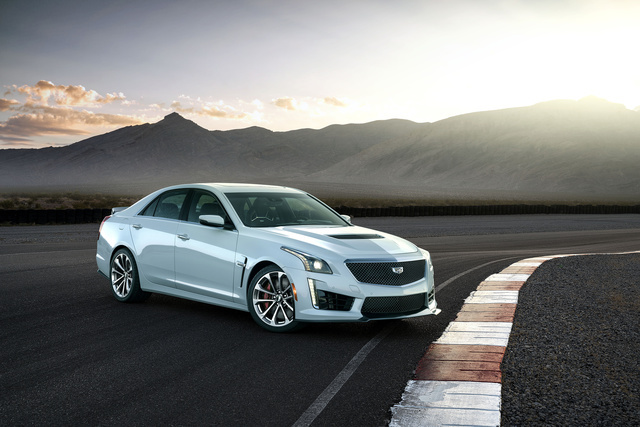 This 2-day course takes place at the Spring Mountain Motor Resort in Nevada and teaches participants high-performance driving techniques to extract all of the performance potential of the CTS-V. The academy includes two nights of lodging, a Cadillac courtesy vehicle, transportation to and from the airport, and breakfast and lunch. The only thing participants need to provide is a flight to and from the academy. What's your take on the 2018 Cadillac CTS-V? 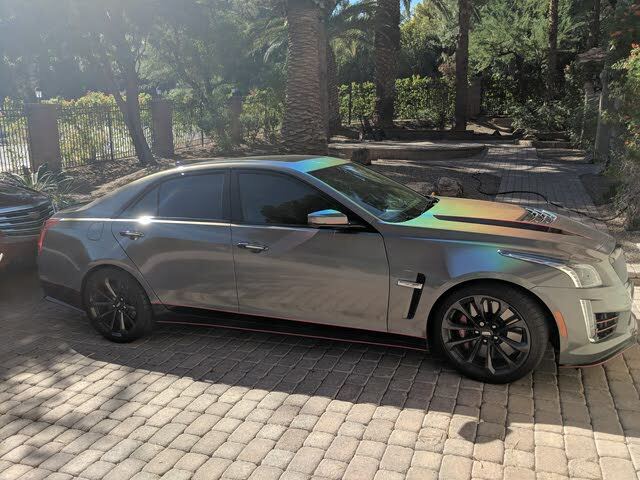 Have you driven a 2018 Cadillac CTS-V? Enter your zip to see incentives for a new CTS-V in your area. CarGurus has 614 nationwide CTS-V listings starting at $9,999.